April’s Aunt Agatha (Aggie) Marbles, a woman crime solver not unlike Agatha Christie’s Miss Marples, pays her a visit at Channel Six News and suggests that she would like to meet the Turtles. Meanwhile, Michaelengelo and Leonardo encounter two crooks, Bruce and Rodney, who are stealing kimonos from all over town — including Master Splinter’s favorite kimono which had been sent out to the Quick Kimono Cleaners. 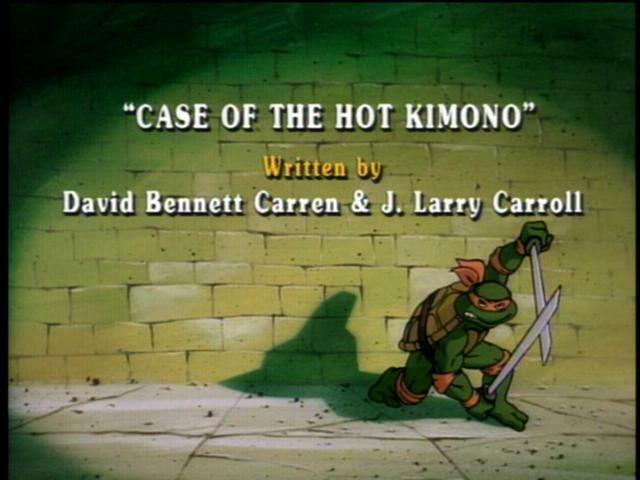 The Turtles team up with Aunt Aggie to solve this mysterious caper and to retrieve Master Splinter’s kimono. April and Vernon, following a bogus tip, were kidnapped by the Big Boss, Don Tortelli, who is the mastermind behind the theft of the kimonos. Don Tortelli thinks that April knows something about the stolen kimonos and tortures her and Vernon with a feather in order to make them talk. Meanwhile, having had little success finding the crooks, Aunt Aggie concocts a scheme to bring the crooks to them. Donatello dresses up like the infamous Cal Worthington of Southern Caliifornia Auto dealership fame and makes a bogus commercial advertising himself a “Kimono Kal” owner of the famous “House of Used Kimonos.” Don Tortelli sends Rodney and Bruce to steal the kimonos, but what they end up stealing, of course, is a crate of Turtles who are delivered to Don Tortelli’s penthouse. The Turtles and Aunt Aggie rescue April and Vernon, but Don Tortelli and his “boys” escape. Thanks to some trash left behind in the Penthouse, Aunt Aggie deduces that Don Tortelli and the stolen kimonos are on a freighter at Pier 77 which is set to sail at high tide. After Don Tortelli and his henchmen are captured Aunt Aggie and The Turtles learn that The City’s kimonos were stolen because of a hidden map that leads to the buried treasure of Emperor Nakamura. That map just happend to be sewn inside of Master Splinter’s kimono, but it was much to do about nothing, as Aunt Aggie had led an expedition that recovered the lost treasure the previous year!